Many humans find it hard to be in a mall for very long; imagine how it feels for a polar bear to live in one. Pizza the polar bear doesn't have to imagine this because since January it's been his reality. Pizza, as he is named (no relation to Pizza Rat), and a number of other popular aquarium animals are being kept in an ocean theme park in the new Grandview shopping center in Guangzhou, China. All is not going swimmingly for the theme park as more than 310,000 people have signed an online petition requesting that the facility be closed. The petition describes Pizza's living quarters as including "nothing natural" with "no attempt to create an environment that would meet the needs of any living bear." 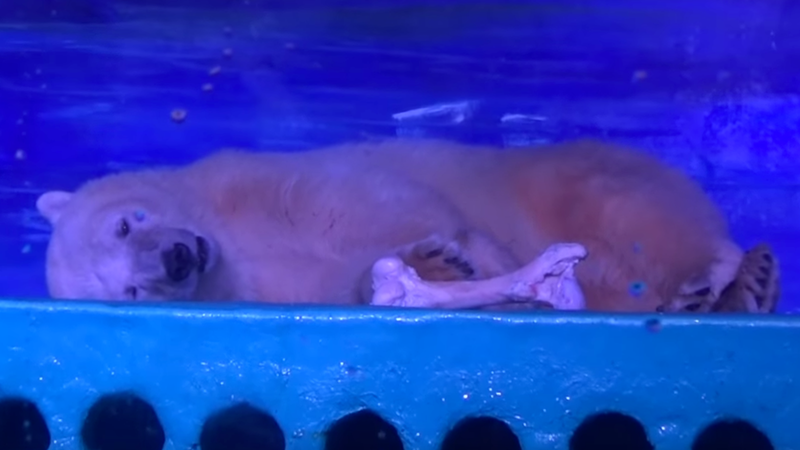 While some are calling Pizza the "world's saddest polar bear," this title was recently held by a polar bear named Arturo at a zoo in Argentina. After 20 years in captivity, Arturo recently passed away after years of animal rights activists demanding that he be moved to a better facility in a cooler climate. The petition to free Pizza was started by Animals Asia, a Hong Kong-based animal rights charity that first visited the aquarium in April after being invited to give advice on how to improve the animals' conditions (which would also improve PR optics). Upon seeing the place, Animals Asia Animal Welfare Director Dave Neale said that “it would appear unlikely that Grandview, with the space it has, will ever be able to provide anything like the facilities required by animals. There will never be a time when polar bears can ever comfortably be kept inside a shopping center, and certainly not in the small glass case that currently houses them." According to Neale, the awful facilities are as much due to a lack of knowledge on the staff's part as commercial pressures. For this reason, Animals Asia agreed to help work to improve the conditions of the animals—especially since they aren't likely to be moved any time soon. Neale made sure to clarify that keeping animals in these type of conditions is never acceptable, and they are only helping out due to a lack of immediate alternatives. Upon revisiting in July, Neale got a comprehensive tour of the park, which he said the staff are legitimately trying to improve. He said his recommendation for piles of snow for the bears has been met and that the bear keeper is starting a "program of enrichment"
While negative media coverage is paying off in these small improvements, it does not appear to be impacting visitor numbers, according to Neale, who wrote that "animal lovers may be boycotting the facility, but those less well aware of the issues are not. Commercially, any impact is not hurting." Taking animals from captivity back into the wild is an extremely arduous and risky endeavor as their behaviors are maladjusted for life outside an enclosure. In the case of polar bears, the mere continued existence of their habitat is in danger as climate change rapidly warms the Arctic, disrupting the ecosystem on which they rely for food and shelter. According to the ICUN, polar bears are a vulnerable species and their biggest threat in the wild is sea ice loss and climate change.